C has an aunt who used to work for a princess. Yes, a princess that lives in a palace in a kingdom not so far away. I would sit enthralled by her stories of riches so grand it was almost unreal…like my own personal One Thousand and One Nights. Gold and jewels and family vacations on private jets, mammoth shopping jaunts and bespoke sports cars and magnificent feasts. The parts that captivated me most, not surprisingly, were the magnificent feasts. As she is a kindred spirit when it comes to food and cooking, these were always the most colorful parts of her tales. Stories of the amazing meals prepared, the ingredients used, the sights and smells of the large (large!) pantry and kitchen. Befriending the chefs, she managed to learn the cuisine…which she brought back with her (along with a hoard of spices and dried herbs) and continues to share with us. The dinners she prepares are much-anticipated events involving multiple courses and an incredible array of exotic flavors. – Heat a couple of glugs of olive oil in a skillet. Slice the small Asian eggplants lengthwise into two. When oil is hot lay eggplants cut-side down in the pan. Fry until golden brown and then turn. Fry the other side until eggplant is cooked. I like mine with crisp edges but still soft in the center. If you’d like to fry it until totally crisp go ahead! – While the eggplants are frying, prepare the yogurt dip. Mix yogurt, garlic, and olive oil in a bowl. Add sea salt and freshly cracked black pepper to taste. Store it in the fridge until ready to serve. Top with a sprinkling of sumac just before serving. – When eggplants are done, fish them out of the pan and drain on a paper towel-lined plate. Dust liberally with sea salt and sumac. Serve with the yogurt dip. – Serves two as a side dish. As the name implies, small Asian eggplants are smaller versions of the long skinny eggplants most commonly used here. I love them solely based on their looks, as what’s not to love about a vegetable’s cuter version (one of the reasons I also love Brussels sprouts)? You can see them in this enticing still life of local vegetables. If you can’t find them where you are, substitute with any of your friendly neighborhood eggplants, and just slice them thinly. Fried eggplant and yogurt is a pairing that works wonderfully for me – please have it freshly fried as the contrast between the warm eggplants and the cool yogurt adds to its deliciousness. The sumac adds a pleasing vibrancy to the whole dish, highlighting the eggplant’s mild smokiness and the garlicky zing of the yogurt. We had this with our dinner, but you can easily prepare this as part of a larger spread of appetizers…or even as a video-marathon snack! 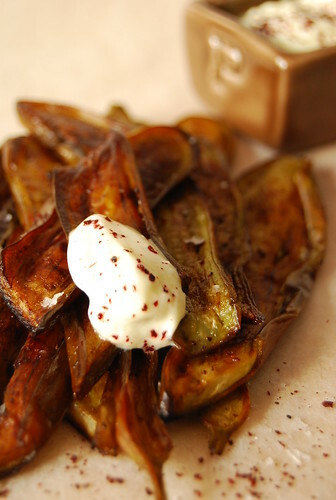 If you are a bit health-conscious you can roast the eggplants instead with just a smidge of olive oil and salt. If you have leftovers (you won’t), mash the eggplants and yogurt together and you have a spread for tomorrow’s lunch. Thanks for this post, I've learned something new today. I wonder where I could find Sumac here in the Philippines. Beautiful photo. It's warm and earthy like the spice. I don't know where find to sumac here but if you have an idea, please let me know. i love aubergines and this reminds me very much of one i recently made (recipe on blog) from ottolenghi but that was with a divine saffron yogurt! but garlic i like too so this i am going to do! Those fired eggplants look fantastic! A wonderful combination. I'm crazy about learning about lives of royalty! I wish I would meet C's aunt when I visit the Philippines. This dish sounds very moreish – surely fit for kings! I love eggplants…this recipe is something new to try and it looks simple and easy to make… i just wonder where I could get sumac here in SD. are there any alternatives? I also like my edges to be crisp and the mid portion soft… and I love it when it slips through your mouth… yum! oh my, they look really delicious! if only our nearby grocery is still open at this time of the night! i love eggplants! fried eggplant dipped in mayo or honey mustard sauce is my fave and I would love to try this one! same as the others – where can i find sumac here? this looks like a winner! 🙂 yum yum! Hi Meeta! I will have to check out that recipe! Saffron yogurt…must try! Hi Ling! Haha! Try it…it’s so easy to make! Use really good yogurt though! I can't wait to try this one. I love eggplant. Great dip! Oh I *just* love sumac! I've discovered it not so long ago and it captured my heart and taste buds straight away!! Will be trying your suggestion asap! I am making this today. Will get hold of the eggplants. Cannot WAIT! My first time on your blog and I see this recipe! This is what we call in Lebanese cuisine a "fatteh"; we use sumac all the time, especially for a salad "fattoosh". Love your adventurousness that made you try this very unusual spice! Joey, I am surprised that you used sumac. We sprinkle this over persian kebabs all the time. This looks delish! It's fate, I tell you. I've had a bag of sumac in the spice drawer for a couple of months now… and Greek yoghurt in the fridge!!! Eggplants and yogurt… learn new things everyday. I'm going to search for that Sumac spice and try this coz I do love fried eggplants. Thanks Joey 🙂 . Hi Tasteofbeirut! Thanks for stopping by! Nice to know this is an actual dish in Lebanese cuisine…I love trying out and exploring different cuisines 🙂 I have tasted fattoosh before and loved it! Hi Veron! Persian kebabs…yum!!! I’m going to have to go over your recipes again and try to make some at home! Hi Joanie! It really is such a great vegetable! I love it too! Hi Ling! Fate indeed! Now you can try this out 🙂 Try using your sumac also in salad or grilled meats…it’s a great flavor to add! I love eggplant and I have a thing for dips right now. This is something I would really love to try! the princess story sounds enchanting… then once comes to the part about sumac and your recipe, everything real glows! I am so with you about the asian eggplants too! For kyobinbou, Flavors and Spices also has an outpost inside SM Supermarket in Megamall. I love the combination of flavors here – yogurt to cool the oil from the eggplant, and a touch of spice too. Hi Gattina! Love Asian eggplants…they are also the best suited for another favorite eggplant dish here…tortang talong (eggplant omelet)! Simple and delicious and we Love SUMAC. I love sumac, it is one of my favorite spices. This dish looks insanely delicious, I know what I am making this weekend. Hi Aysegul! Thanks for dropping in 🙂 I’m loving sumac too! Hi Erin! Glad to find another sumac fan here 🙂 Hope you like this! Love eggplants and I am so loving the flavors of this gorgeous recipe. I love this and must try it!! Delish! I follow your blog but haven't commented before. I love eggplant in any form. Have you tried any other eggplant-based middle-eastern dips? Sumac is such a fantastic spice. I recently made pita chips and sprinkled some on them before placing under the broiler – to go along with homemade hummus. Visit my friends site sometime – Yummy CEBU… 🙂 C ya!!! More stories from the aunt! They sound fantastic. And keep on pairing them with recipes like this one. Yum! Hi Bordeaux! I know! Her stories are of another world! Hey Joey! Just wanted to share that I was so happy to have found Sumac in our regular grocery down the road. Can't wait to try this, I LOVE both eggplant and yogurt. Thank you for your post. I love eggplant anything and this sounds like a great way to have it. As for anyone in the States looking for sumac, I have gotten mine from Penzey's store (or catalog if you don't have a store nearby). I used sumac in a Israeli couscous/carrot dish years ago. It really added a nice, lemony flavor. Hi Mireille! Glad you found it and hope you like this 🙂 I also love eggplant and yogurt!